We don't cover a ton of Target stuff on the blog, and their selection is a little slim at the particular location I was at, but I gotta bring something home to the family, so that means it's time for a classic flavor. I've scooped down a bit and we're still look pretty good. One of the things I always like to take a look at is the makeup of the cookie dough chunks. Happily Target has gone the proper way by adding tiny chocolate chunks to the cookie dough. I know it's a tiny crunch, but when you mix a well flavored bit with that familiar (yet minimized) pop, it always makes me happy. So how does this one taste overall? Nice. 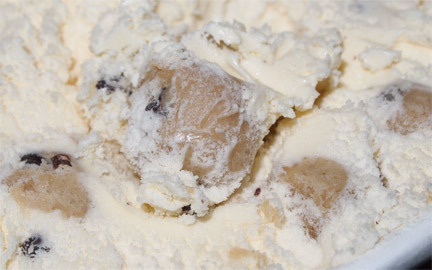 It's a soft scooping ice cream with a decent vanilla flavor that's really just a back drop for the inclusions (mix-ins). 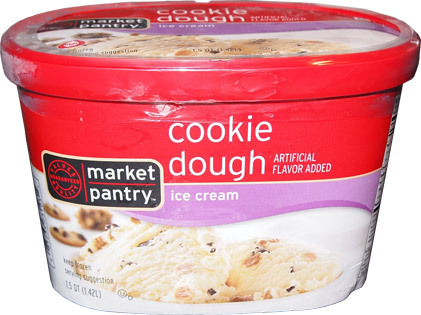 The cookie dough packs a surprising amount of flavor with a nice texture to boot, especially for a store brand. No complaints here! You know how reviewers always say "the bitterness of the chocolate...."? Well, I don't usually get bitterness. I mean I can, but in general, my internal wiring means that I tend to miss or overlook it. However, OH BOY do I taste it here. I was (amusingly) shocked at just how much that bitter taste came through the ice cream and cookie dough. As if that wasn't enough, it strongly lingered to boot! 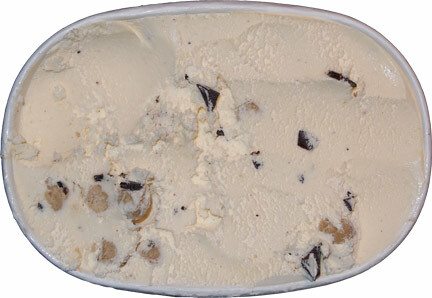 We've got some serious sized chocolate chunks here and when you hit them, you better be prepared. Did this ice cream last long in my house? That would be a no. Thankfully I got first dibbs and a second scoop in before it was gone. It's definitely not a dense super premium ice cream, but the overall flavors popping out of the base make this a fine example of a classic flavor. (Yes, the chocolate is a little too bitter, but the quality of the cookie dough helps balance out the overall judgement on this one). You ought to try 7-Eleven's store brand ice cream. I was in there the other day and saw they had two shelves worth of various pints and quarts. 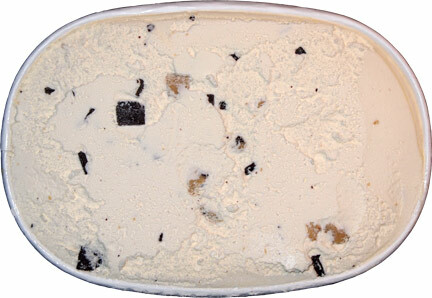 I got a pint of cookies and cream (you can always judge a brand by how they make C&C). It was pretty darn good, especially at $2.50 a pint. The whole time I kept think, "Hmm Dubba should review this stuff." Please give it a try and tell us what you think! !